Secure tips: If you have a sensitive news tip or a government document and you'd like to share it with me through an encrypted channel, please email my secure account at jonathanvswan@protonmail.com to get my Signal number. A major misconception on Capitol Hill right now is the notion that Mick Mulvaney is behind President Trump's decision to back a lawsuit to demolish the Affordable Care Act. After a week of talking to sources who've discussed the matter privately with Trump, it's clear that this health care push is coming from the president himself. These people say Trump thinks it's a great idea to try to brand the GOP as "the party of health care” by backing the controversial litigation and pushing for legislative change. Behind the scenes: Trump has privately said he thinks the lawsuit to strike down the Affordable Care Act will probably fail in the courts, according to two sources who discussed the matter with the president last week. Trump's view is that Democrats are going to bash him up on health care in 2020 regardless, so ignoring the issue won’t work. He says he wants to "brand" himself and the Republican Party as caring about health care and pre-existing conditions. He plans to repeat this message again and again and again. Trump has asked Republicans to come up with a replacement plan, even though nobody thinks they've got a chance of passing anything through this divided Congress. On top of that, Republicans had 8 years to come up with an Affordable Care Act replacement and couldn't do it. Sen. Bernie Sanders, who at 77 is the oldest 2020 contender, is the favorite among 18- to 29-year-old likely Democratic primary voters at 31%, according to a new poll by Harvard's Institute of Politics (IOP) given first to Axios. Former Vice President Joe Biden follows in second place at 20%, Axios' Alayna Treene reports. The big picture: Candidates with the most experience and name recognition are receiving more support among younger voters, as Hillary Clinton did at this point in the 2016 cycle. But we're still 19 months out from the 2020 election, giving lesser-known candidates ample time to win over young people, as Sanders ultimately did in 2016. Context: In the same Harvard IOP survey conducted in spring 2015, around the time Sanders announced his 2016 presidential bill, Clinton was in the lead at 53% and Sanders polled at just 2%. But just 6 months later, Sanders held a lead over Clinton 44% to 41%. By the numbers: IOP's latest poll has former Rep. Beto O'Rourke in third at 10%, then Sen. Kamala Harris at 5%, Sen. Cory Booker at 3%, and Andrew Yang at 2%. Mayor Pete Buttigieg, Julián Castro, Rep. Tulsi Gabbard, Sen. Kirsten Gillibrand, Gov. Jay Inslee and Sen. Amy Klobuchar all polled at 1%. 20% of likely young Democratic primary voters were undecided. Background: Voter turnout is usually low among young people. However, the 2018 midterm elections saw "the highest level of youth participating in a midterm cycle in at least the last 25 years," according to Tufts University's Center for Information & Research on Civic Learning and Engagement (CIRCLE). Young voters also tend to lean liberal. In 2018, CIRCLE reported that 67% of young people voted for a House Democratic candidate, and 32% voted for a House Republican candidate, a 35-point gap. Why it matters: The youngest Americans — millennials and Generation Z — will make up 37% of the electorate in 2020, per Pew Research. "This will be one of the most significant sized youth vote than we've had in many years," John Della Volpe, director of polling for IOP, told Axios. "Young people are more tuned in and likely to vote now than they were at this time 4 years ago and 8 years ago," he added. "For any other candidate to fight their way into the top 3 tier [of the Democratic presidential field], they will have to be incredibly competitive among young voters, if not win the youth vote entirely." Methodology: Interviews of likely Democratic presidential primary voters were conducted between March 8 and March 20. The margin of error for this portion of the sample (n=934) was +/- 4.5% with a 95% confidence interval. The full poll of all 18- to 29-year-olds includes more than 3,000 interviews and will be released later this month. A health care resolution "condemning Trump's legal campaign to take away health care from millions of Americans," per the aide. The Senate will have its next procedural vote on the disaster relief package Monday night. Democrats are arguing that the Puerto Rico portion of the funding is insufficient, and Trump's private comments that he wants to cut off funding to Puerto Rico have complicated the conversation. 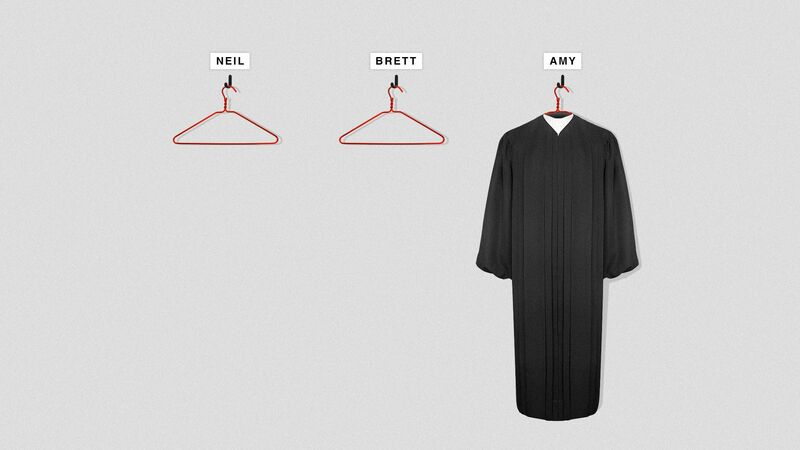 Why it matters: Vulnerable people around the country depend on what Congress does this week. And if Congress can't pass a disaster relief package, can they get anything important done this year? Republican leadership also plans to begin debate on a resolution to change the Senate rules to accelerate the confirmation of President Trump's nominees. Monday: Trump meets with Secretary of State Mike Pompeo, has lunch with Mike Pence, and delivers remarks at the 2019 Prison Reform Summit and FIRST STEP Act Celebration. Tuesday: Trump meets with NATO Secretary-General Jens Stoltenberg and delivers remarks at the National Republican Congressional Committee annual spring dinner. Wednesday: Trump joins a briefing with senior military leaders and has dinner with senior military leaders. Thursday: Trump participates in a meeting with the White House Opportunity and Revitalization Council. Friday: Trump to travel to Calexico, California; Los Angeles; and Las Vegas. President Trump signaled on Saturday that he was intervening to help a Navy SEAL accused of crimes while serving Iraq. "In honor of his past service to our Country, Navy Seal [sic] Eddie Gallagher will soon be moved to less restrictive confinement while he awaits his day in court. Process should move quickly!" Trump tweeted. 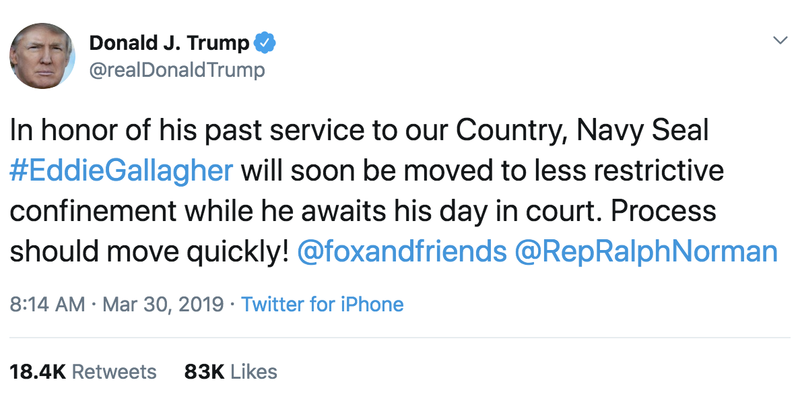 The president tagged the "Fox and Friends" Twitter account and South Carolina GOP Rep. Ralph Norman — both of whom have advocated for Gallagher. Details, per Politico: "Gallagher has pleaded not guilty to a series of charges stemming from his 2017 deployment with the California-based SEAL Team 7. Apart from the accusation that he murdered a teenage ISIS fighter under his care, military prosecutors contend that he held his re-enlistment ceremony with the detainee’s corpse. Gallagher is also accused of shooting two civilians in Iraq and firing inadvertently into crowds." Behind the scenes: Trump has been following Gallagher's story closely — especially through the coverage of "Fox & Friends" hosts Pete Hegseth and Brian Kilmeade. In addition to his public advocacy for Gallagher, Hegseth has spoken to the president privately about the case, a source familiar with their conversations told me. When I asked him about this, Hegseth said he did not want to comment for the story. Between the lines: "This is not the first time Trump has cited Fox News while taking an interest in a case involving a US serviceman on combat duty," the Guardian reports. "In December, Trump cited Fox News host Pete Hegseth in a tweet that said he would 'be reviewing the case of a U.S. Military hero, Major Matt Golsteyn', a former green beret 'who is charged with murder' and could face the death penalty from our own government after he admitted to killing a terrorist bomb maker while overseas."